Do you ever wake up with your wheels turnin' in the middle of the night and everyone around you is snoring? It's Sunday and it's too early to go to church...so I'll write my own sermon. I do realize that those who read my posts are probably in the "choir". I spend a lot of time at meetings where we discuss what is best for kids. I am grateful to work in school where we are reminded by our leaders to focus on what is best for kids. But, I think there are some really simple favors we could do for our children (as parents, teachers, coaches, care providers, counselors, etc). I've worked with children in each of those roles (except my counseling experience only includes "camp" counselor...not a real counselor/therapist). I am absolutely not an expert...just a person who cares about kids (who is a little worried about the trends I'm seeing). In my other life, I worked as a Speech-Language Pathologist...so most of my "sermon" is related to communication. When I first started teaching, students made eye contact (without being prompted to) unless they had certain special needs. Now, I spend lots of time teaching all of my students to make eye contact at the beginning of the year. It wasn't something I had to teach before. But now, it's necessary. Are ya with me? I wish I knew how many times a day lower elementary teachers say the words... "Please look at me." "Look at my eyes." "I need you to look at me when you're talking.". I don't know that number, but I know it's a lot more these days. The favor we can do for kids...make eye contact. We model. We teach. They learn. When you've been teaching as long as I have, you notice trends. In order to maintain basic conversational turn taking...you have to respond. Basic turn taking is the equivalent of sharing while playing. It takes two people to share and two people to have a conversation. Otherwise it's just a "sermon" like this one. Funny! Question asked = answer. Wouldn't ya think? If we teach it, they will answer. I hope. Families are overwhelmed by crazy busy schedules these days. Turns out I am an expert on being overwhelmed by a crazy family schedule. Please notice that I said "being" not "handling". As recently as 5 years ago, when I asked my students if their parents read a story to them the night the majority of them would say yes and happily tell me about the book they enjoyed together. When I ask the same question now, less than 5 students each time report that their parents read to them. I work in a place where we have very supportive parents. I confess, even I am guilty of skipping story time on some of our super busy nights. The majority of my students practice reading at their independent level each night and return homework consistently. Snuggling up to read to our kids fosters a love of reading, models good reading fluency, develops imagination, deepens comprehension and builds vocabulary. When I get old (older), I want our children (the ones I'm raising and teaching now) to be independent, thoughtful adult decision makers. I think it's important to practice that now. I was never a cheerleader...until I became a teacher and a parent. Let's cheer for these kids as we encourage them to try, before they ask for help. Let's show them that we are here for them. Let's show them we expect them to try and know they can succeed eventually, without an adult doing the task for them. When I was a child, my dad put index cards all over our house with the same words on them for my brother and I to read each day before school. The index cards said, "If at first you don't succeed, try and try again." If we expect them to, they will become independent, thoughtful little hard workers. When we see a proud smile on the face of a child who did something ALL BY HIMSELF that is our reward for encouraging him to try. I went on a technology team visit to a school in another district last week. I spotted this sign on their sidewalk in front of the building. I love it! To me, it screams "we trust you to walk in and put your own things in your locker". When kids struggle, they learn to cope. When kids don't ever have to struggle, they break down when faced with simple problems. I see this in the classroom, on the soccer field, in the dance studio, at church, at birthday parties, in the grocery store and in my house. It's ok for kids to do hard things. I'm not talking about asking them to do things that are not possible for them. I'm talking about reminding kids that you believe they can do challenging things. Encouraging them by reinforcing that you want them to keep trying. Helping them understand that life is not all roses and ice cream and that it's ok for someone else to win. Back in the day, not everyone earned a trophy. Only the winner did and I'm ok with that because the rest of us learned to cope, congratulate and work harder to achieve our goals. Sermon over. I'm now officially tired. And my husband and my doodles are still officially snoring. Thanks for doing these favors for me! I promise to keep trying my best to do them for my own kids and students. Don't ya love that my mom reads my blog? I sure do! Thank you for listening...even though I know you're doing this and a whole lot more for kids each day! Sometimes I just think it's important to throw out a public reminder about some of the favors we work so hard to do for kids...just because we care so much. Whew...thank goodness the first comment was a positive one! Sometimes I worry that my middle of the night posts might be a bit much in the morning. :) Thanks for the feedback. It was a relief! LOVE this! 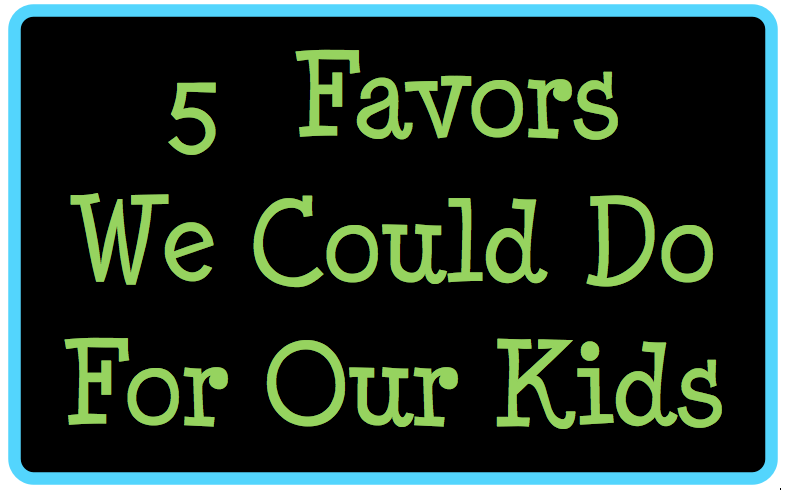 I teach pre-k & would love for almost all of my parents to read this & take it to heart. Even 4-year-olds can experience & appreciate independence! So true, Anne! It takes a village (one that works together). Thank you for visiting my blog today. Excellent! You presented these truths in a very gentle, caring way. I couldn't agree more! Thank you, Kelly! Your kind words truly mean so much. I teach in Dexter (but live in Saline). Are you close? A few of us are hoping to organize another meet up. We're super close then! If you send your email address to me, I'll keep it on our list of people to contact about a meet up. Oh my word. I love this whole post. And now I want a "Kiss and Go" sign at my school.